Non-spoiler thoughts first: Another great issue! Johns has been doing a really great job with this arc, and things continue to move at a great pace. 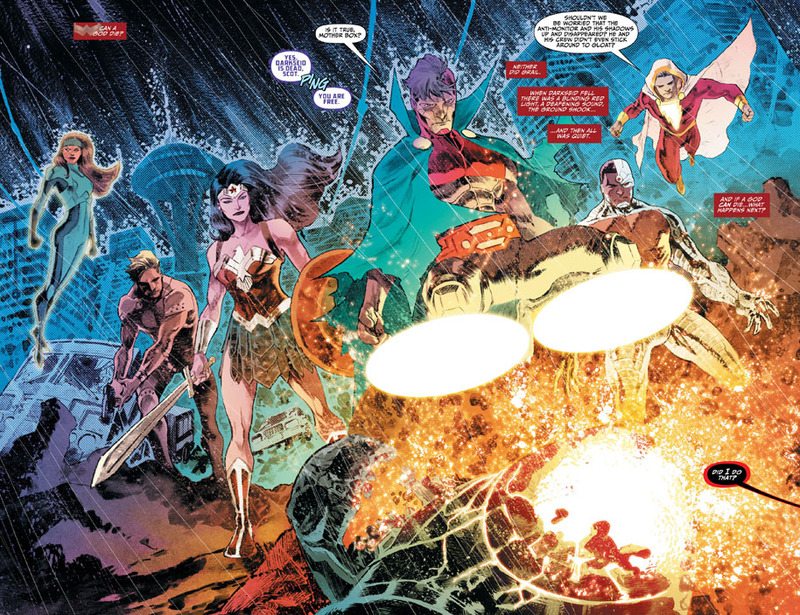 With Darkseid dead and Anti-Monitor reverting back to his Mobius self after the events of last issue, it appears a ripple effect is happening across the Justice League. With many people already viewing the Justice League as gods, we finally see how they are like when they actually become gods. The thematic exploration of power and morality continues and the League is forced to face their new status. This is a must read issue as after this issue comes the Darkseid War spin-off issues that will start rolling out next week! 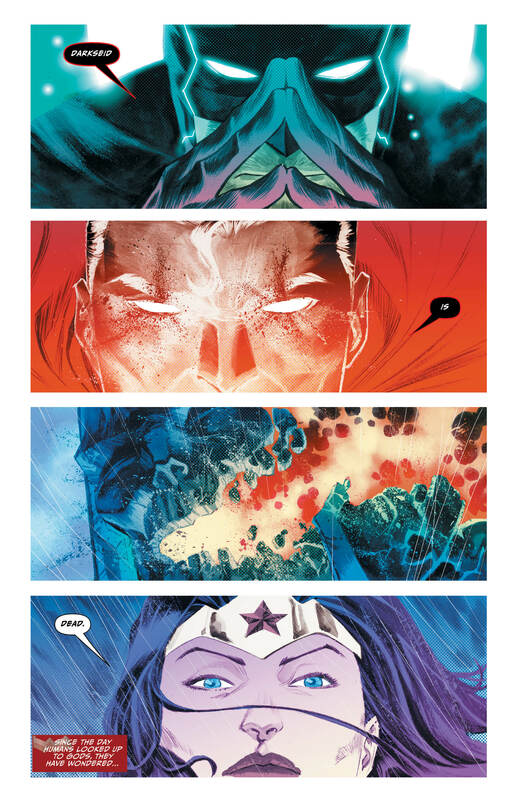 Alright spoilers for Justice League #45 follow. The impossible has happened and Darkseid is dead. Apokolips is without a leader and Anti-Monitor is reverting back to his Mobius self. However even though the supposed all-knowing Bat-God likes to claim the war is over, it most certainly is not. The Flash has turned into the God of Death. The God of Death understands the value of death. Without a limit on our lives it would be meaningless. Our actions wouldn’t have as much value and our goals wouldn’t be as important, because if we were immortal we could just do it later, there’s no rush. But just because death has philosophical importance, doesn’t mean there should be a god running around with that sort of power. Barry is trying to fight the fusion, but it’s going to be hard. Superman has turned into the God of Strength. Most consider Superman to be godlike anyways, but now we can really see what it would be like if Clark Kent grew up to be an arrogant god. The thing about Superman is that so many consider him to be just this brute with no personality. I hope that his evolution to the God of Strength becomes an interesting look at who Superman really is. Now that he has become the God of Strength, without the humanity of Clark Kent, it’ll be an interesting discussion on who Superman really is without the personality of Clark Kent. Shazam has turned into the God of Gods. Well that’s a lot of power to give to a kid! Billy now has the combined power of the New Gods, but with that much power I’m sure he’ll make a few enemies. This will be a huge test for Billy, he’s not a kid anymore, that’s for sure. Batman continues to be the God of Knowledge. Although he was smart before, Batman balanced his intelligence with his inherent humanity, now that’s gone, which isn’t a good thing. Also I’m not sure how accepting Gotham will be of the new Bat-God. Then you have Lex Luthor who in Justice League #45 became the God of Apokolips! The planet of absolute tyranny and Luthor is supposed to be its symbol for hope? It’s clear the prophet got some things wrong, because Lex Luthor is certainly not Clark Kent, and he definitely should not have the power of gods. I mean Luthor was pretty arrogant before, but now with the power of a god and the planet to rule over? I can only imagine what he would get up to. Thankfully Wonder Woman, Cyborg and Green Lantern are unaffected right now. Wonder Woman is a focal figure in this arc, as she is the only one that was actually truly a god before everything. Even with her status she was responsible with the power and didn’t force others to accept her philosophies just because she was a god. The issue of power, responsibility and morality are big themes in this arc, and perhaps it will be Diana who makes it clear to everyone what being a god truly means. I think we could get some really great character exploration from the spin-off titles, exploring how the characters deal with their new powers and how they break free from them. Justice League #45 unfortunately did not have Fabok’s gorgeous art, and although I love Manapul’s style, I feel like it doesn’t fit in as well with the epic feel that this arc has, as well as Fabok’s did. We’ll see the return of Fabok in Justice League #47. 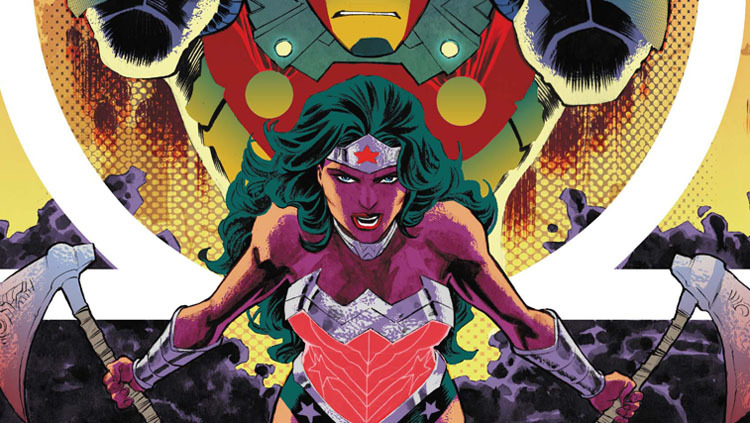 Overall Justice League #45 was a great issue that set up the League’s new powers nicely. I know I keep saying this, but epic is the perfect word to describe this arc so far. We’ll see the return of the Crime Syndicate soon which will be interesting to see, but until then we have the Darkseid War solo issues coming out in the next few weeks. Looking forward to seeing how everything unfolds! 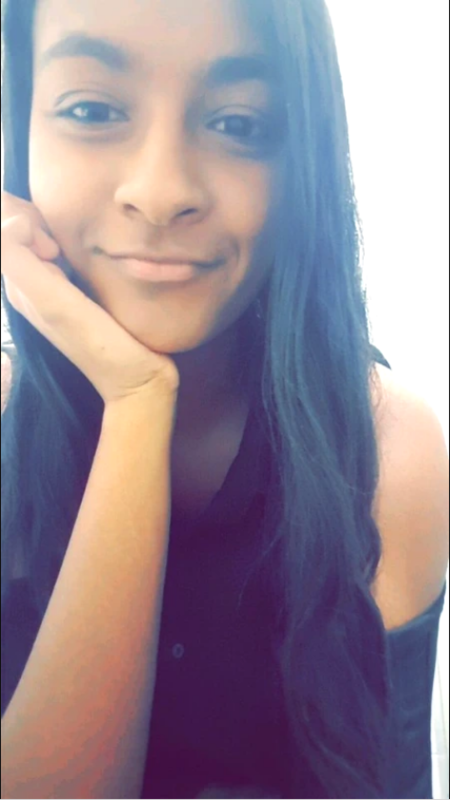 7.9/10. Agreed! Johns has been killing it with this story arc, looking forward to the spin-off titles as well!